You’ve probably seen a lot more activity around the MetaCurrency Project in recent months: a new Ceptr web site, Ceptr broken down into clearer sub-projects, blockchain alternatives, lots of code releases, Hackathons, virtual potlucks, online presentations, etc. I guess we ought to make it clearer what’s going on. We’ve been on a quite a dev sprint on Holochain this last month in preparation for a Holochain Hackathon in March in San Francisco, where we are inviting folks to come and build Holochain apps! If you are interested in participating, please fill out this application. This is #4 in a series of dev posts. This past month I've made little coding progress. I'm still sorting through some Semtrex bugs in the few time windows I've had. So this month I want to share a higher level pattern and perhaps a bit more philosophical view on Ceptr coding. As we've been developing Ceptr, we've recognized two different approaches to solving programming problems. The first is what we might call the linear or algorithmic approach, and the second we might think of as a simultaneous or pattern matching approach. This is #3 in a series of dev posts, which just jump right into deep end of the techie pool. Ceptr creates a new "communication coin" that we can still count on (in both senses) but from which it's much much easier to "extract sense." In fact, the "sense" gets baked in at the bottom layer in that everything in Ceptr is built out of semantic trees. Extracting "sense" however has lots to do with pattern matching. Regular Expressions provide a rich expressive capacity for discovering the patterns in text. We have build Semantic Tree Regular Expressions (Semtrex), as way to do the same for our semantic trees. This is #2 in a series of dev posts, which just jump right into deep end of the techie pool. At the core of Ceptr you will find agent-like receptors which send each-other messages. We've provided a simple yet sufficient instruction set for rich message programming, taking into account both synchronous and asynchronous programming needs. This is the first in a series of posts I want to write about both building Ceptr and coding in Ceptr. In many of them I jump right into the middle of deep tech, so hold on to your horses, and enjoy! January 2016 is a HUGE month for us at the MetaCurrency Project as we approach the release of Ceptr, the next economy / next Internet tools we've been building these past years. Come play and explore with us at one of our events in the San Francisco / Bay Area! The MetaCurrency Project's requirements for decentralization combined with a commitment to leveraging organizing principles of living systems led us to invest a lot of time in the past 5 years developing Ceptr. Ceptr is a rebuild of much of the computing stack optimized for decentralized sense-making, computation and composability. This means semantics baked into the lowest levels of memory storage, self-describing protocols which let anything talk with anything else, blockchain-like abilities for decentralized data storage and computation. People have been asking how they can find out more about Ceptr... What it is... How it works... etc. There are a few layers of answers to this question. The first is that we need to publish more, but nonetheless, there's some pretty substantial stuff for those who want to dig in. The quickest overview is our MIT/KIT Webinar Demo which shows how most things work at a reasonably low level. Most important is the Ceptr Revelation, which we want to keep expanding and updating as a not-quite-whitepaper. There's our Github repo, wiki and Doxygen generated API documentation. There's Arthur's blog and some Crypto-Currency related writing differentiating our approach to BFT & distributed apps from Blockchain. This is the Ceptr webinar that we did at the invitation of the MIT Kerboros Internet Technology group as a part of their monthly series of emerging web technologies to watch out for. Ceptr is built out of Receptors -- lightweight virtual machines which can be organized fractally. This means you can compose new communication and computing patterns out of receptors as coherent building blocks. But receptors themselves are built out of another coherent structure: semantic trees. Similar to how our body is made out of cells, and the organization of cells is what makes different kinds of organisms. Cells, themselves, are built out of amino-acid complexes at a lower level. We produced a couple short videos showing how semantic trees work for both DATA and PROCESS for our MIT-KIT Webinar about Ceptr. This blog post just focuses on the excerpt about Semantic trees for data structures and execution of code. We've been asked to present our work on Ceptr via an MIT webinar as part of their (Kerberos and Internet Trust) series highlighting notablenew technologies. You can find the event on the MIT web site, and participate. We'll post a recording to this site afterward. In designing Ceptr we've discovered a pattern in how systems build meaning. It's likely that someone else has already written about this, but we haven't found it, so we don't know what anyone else calls it. We're calling it Semantic Alternation. I am a Strange Loop. You're a Strange Loop. Wouldn't Ceptr likely be Strange Loop Too? 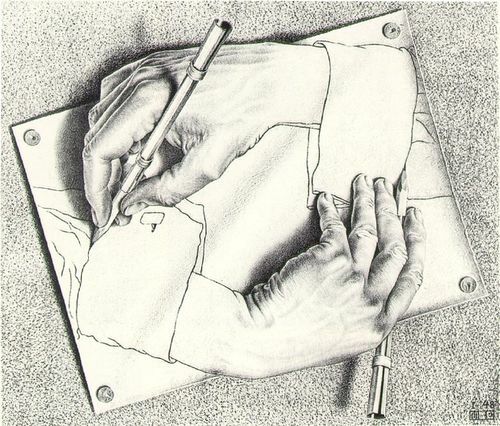 Douglas Hofstadter, in Godel, Escher, Bach and I am a Strange Loop, weaves a pretty compelling tail of how mind and consciousness emerge from self-referential systems configured in a kind of "strange loop." Our consciousness or possibly all consciousness may emerge from this sort of feedback loop with strange interplay between levels. In the vein of continuing to share what the heck we've been doing. We're gonna share our psuedo-white-paper even though it's totally a work in progress. For the past few years, we've actually been working toward building Ceptr, but we haven't been very public about much. I mean we've posted code to github as we've built, but there's been no way for anyone to really understand what we're doing. We're working on changing all that.